﻿Dr. 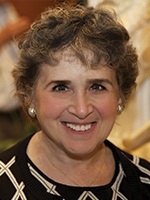 Joan W. Berman is the recipient of the 2012 Women in Neuroscience Lectureship Award. A true leader in the neurovirology field, Dr. Berman embodies all of the characteristics of a great scientist and is a role model for young investigators. Joan has served as the Chair of the ISNV Women in NeuroVirology (WIN) Committee for the past four years working tirelessly to ensure that WIN promotes and improves communication among female scientists in the ISNV membership. Beginning at the ISNV conference in Miami in 2009, Joan helped to establish a program through which junior scientists were teamed up with senior mentors who would provide advice regarding career issues such as promotions, negotiation skills and balancing work/home commitments. After completing undergraduate studies at Brown University, Dr. Berman received a Ph.D. from New York University Medical Center. She completed five years of postdoctoral training in the Department of Pathology at New York University Medical Center and joined the faculty at Albert Einstein College of Medicine in 1986 as an Assistant Professor. Dr. Berman is currently Professor in the Departments of Pathology and of Microbiology and Immunology at Einstein. Included among her many leadership appointments at Einstein, Dr. Berman serves as Director of the Experimental Pathology Program, Director of the Immunology and Pathology CFAR Core, Director of Basic and Translational Research for the Medical School, and is the Faculty Advisor for the Graduate Division. She is also an external consultant to NIMH for CNS HIV Anti-Retroviral Therapy Research (CHARTER) and serves as a member of several NIH review panels. In keeping with her strong commitment to promote women in science, Joan is the Chair for the Women’s Mentoring Program at her Alma Mater, Brown University. Research from the Berman laboratory has greatly enhanced our understanding of many aspects of HIV associated CNS cellular dysfunction, including bloodbrain barrier damage, macrophage trafficking and signaling and interactions of substance abuse with viral infection. Contributions from her research to the HIV field have shed light on many mechanisms through which HIV damages the CNS and have increased our understanding of host-virus crosstalk at the blood-brain barrier. Joan is a member of numerous professional societies and journal editorial boards. She has contributed to eight books and published over 100 research articles in top journals. Her research laboratory is supported by grants from NIMH and NIDA. Within five minutes of conversation with any of her lab members, it is evident that Joan cares deeply about her research family. She has a passion for mentoring and exudes sincerity for her students’ success. She is determined and diligent in helping her mentees achieve success, even if that means staying in the laboratory until late at night or sacrificing personal time. She takes interest in every member of her team, never forgetting their birthdays, and always making it a point to introduce each of them to senior scientists at scientific meetings. As is said: “A true sign of a good human being is not how they treat people above them, but how they treat people below”. She lives her life by example. Over the years Joan has worked tirelessly to maintain the WIN organization. We are thrilled to recognize her remarkable achievements as a leading neurovirologist!